I’m thinking dark and dreary and freezing cold Wednesdays call for comfort food. Serious comfort food. Like Coq Au Vin perhaps? It sounds very fancy with it’s gorgeous French name, but really this is just a braised chicken stew. It’s so easy! While time consuming because of all the simmering it needs to do- that part is unattended so it’s really not that big of a deal. My personal take on it is dairy and gluten free and is also packed with seasonal vegetables. Because when you cook with an entire bottle of red wine, adding extra vegetables just sort of feels like the right thing to do. 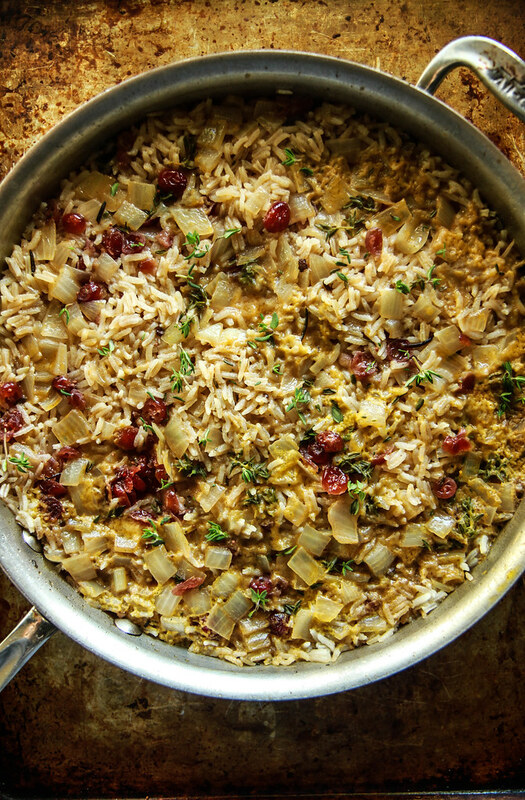 And then there is the Cranberry Thyme Rice. I am not sure I can even do this rice justice for how amazing it is. I’m not sure if this well delight or horrify you, but I cooked the onion and the raw rice in the fat I skimmed off the top of the stew. Eek! Which way did you lean? Delighted, I hope? I just figured, why oil to the rice when we have the most flavorful cooking fat ever right here? And indeed, it led to the most flavorful rice ever. The little pops of sweet cranberry and savory thyme were just the right compliment and festive too! So I last made this on a Sunday. Not your typical Football food perhaps, but maybe it should be!? This is perfect for any day that you will be hanging around the house for few hours. It needs very little attention once it is simmering, but you do need to be under the same roof. And while your family would be very lucky to have this any night of the week, this is also dinner party or even Christmas or New Years worthy in my opinion. I sure hope you enjoy this! In a large dutch oven or heavy pot over medium-high heat add the chicken pieces, skin side down and let the fat render and sear. Turn the chicken on all sides until they are seared, about 7 minutes total. Remove the Chicken and set aside. Add the bacon to the pot. You may have to do this in two batches. Cook the bacon, turning often until the fat has been rendered and the bacon is golden but not too crispy. Set the bacon aside. Add the mushrooms to the hot fat, frying the mushrooms until they are golden, about 7 minutes. Add the carrots and parsnip and toss with the mushrooms. Add the tomato paste and stir into the vegetables. Sprinkle the taioca starch over the vegetables. It will absorb the fat and the pot should start to dry out as you cook the starch and tomato paste. Add the cup of dry sherry to deglaze the pan and cook for another 2 minutes until the liquid has cooked off. Use a large spoon and remove all of the vegetables from the pot and transfer them to a bowl. Add the chicken pieces to the empty pot and add the garlic, the thyme, bay leaf and the whole bottle of wine to the hot pot. Add the chicken broth and if the chicken still is not covered with liquid, you can add a little water until the chicken is just covered. Bring the pot to a simmer and then cover the pot with a lid and reduce the heat to low. Simmer covered for 90 minutes. Uncover the pot and simmer for another 30 minutes. Skim the surface for fat and scum and set that aside in a bowl. Add the vegetables, including the butternut squash and pearl onions. Chop the bacon and add that as well. Continue to simmer uncovered for another 60 minutes. (Keep skimming for extra fat, I wound up with about 1 cup of liquid and fat-save that for the rice!) When the cog au vin has thickened up slightly and the chicken is falling off the bone and the vegetables are tender, season to taste with kosher salt. If the stew is feeling really rich, than I like to add a tablespoon of red wine vinegar at a time and mix in to cut through some of the richness with the acidity. Taste as you go, and only a little bit! When you have about 30 minutes left on the coq au vin, make the cranberry thyme rice. In a large pan over medium-high heat, add the cup of fat and liquid from the coq au vin. Add the onion and sauté until tender, about 5 minutes. Add the rice and sauté until the rice is translucent except for a little white line in the middle. Add the dried cranberries and fresh thyme and then add the chicken broth and 1 teaspoon of kosher salt. Bring to a simmer and then add a lid and reduce the heat to low. Simmer for 20 minutes with a lid and then turn off the heat. 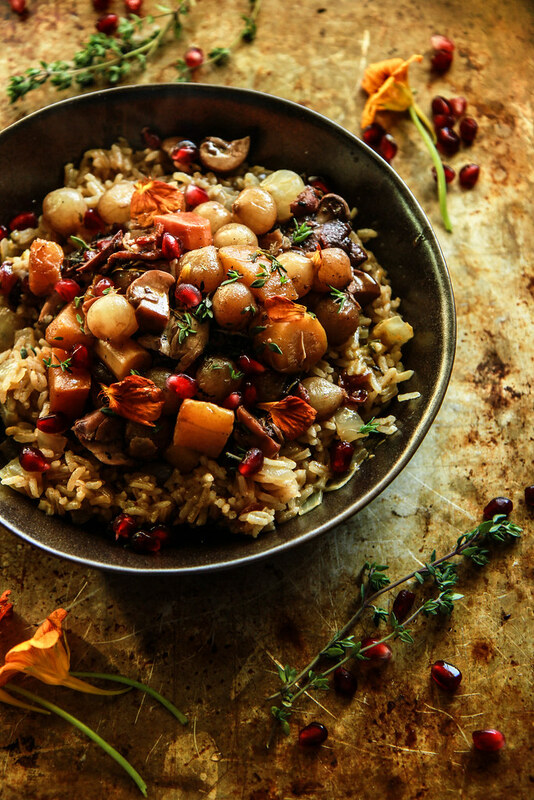 Serve a bowl of rice with a generous scoop or two of coq au vin over the top (garnish with pomegranate seeds if desired). Oh thank you Heather, a whole bottle sounds so much better anywayMaking this tomorrow, can’t wait!!! Ha! It does, right!? I hope you enjoy the recipe! This looks beautiful and sounds divine. I’m definitely on the delighted side. 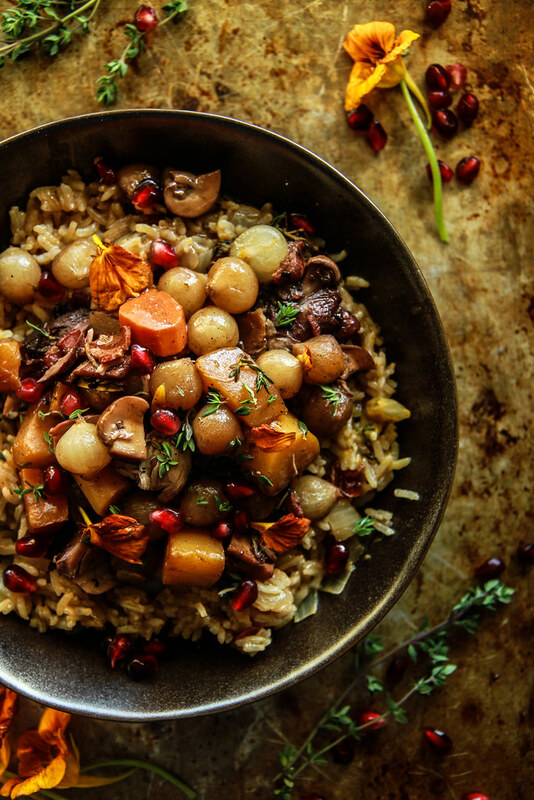 Love this hearty winter dish! What a beautiful holiday dish! Perfect for celebration! 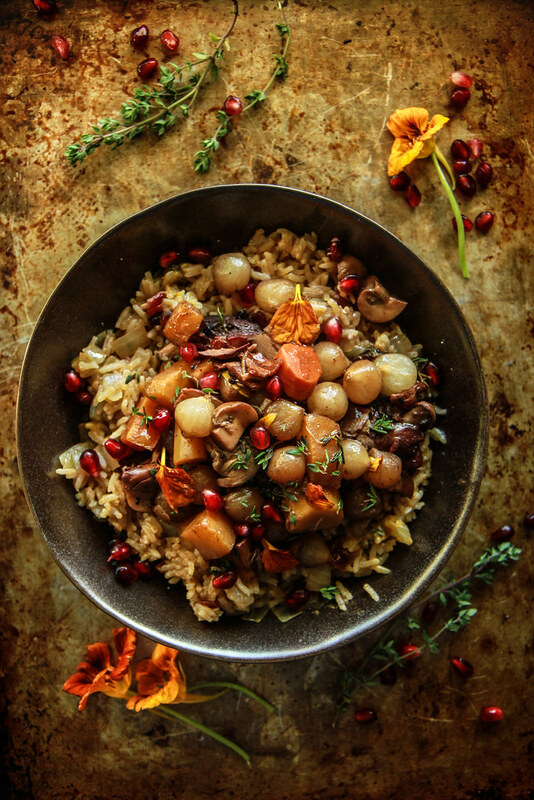 Sounds amazing over risotto Sadie!